After the land was purchased for Webster Lake, the Webster Store, owned by the Richardson's, was the first building on the site of new Webster. They moved to new Webster on April 19, 1953. Albert and Frona Richardson ran the store until 1981, when they sold it to Harold and Wilma Getz. The name was changed to Getz's Kuntry Store. For hunters, fishermen and locals, the store was a great place to buy bait, warm gloves, a cold soda or a sandwich. 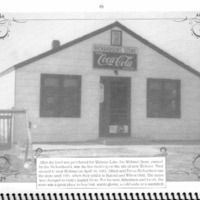 “Webster Store,” Recollections Kansas, accessed April 21, 2019, http://recollectionsks.org/items/show/1800.